When the urgent call came in September for Steve Builta to travel to Oregon to train National Guard members in fighting wildfires, there was little time to decide. For the director of Technology Innovation and Learning Services in the NIU College of Education, the answer came quickly. Two days later, Builta was on a plane flying to the Pacific Northwest. 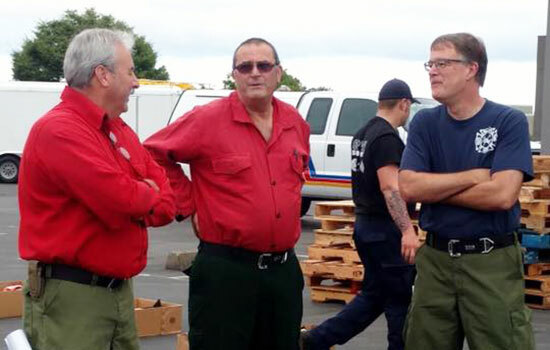 Builta, who is also the longtime chief of the volunteer fire department in Hillcrest, IL, has been on the staff of the Illinois Fire Service Institute for 12 years. He and his colleagues there provide training for mostly volunteer fire crews around the state of Illinois in fighting wildland blazes and prescribed burns. In Oregon, the trainers from the Land of Lincoln joined trainers from across the country to deliver the 40-hour curriculum over four long days. 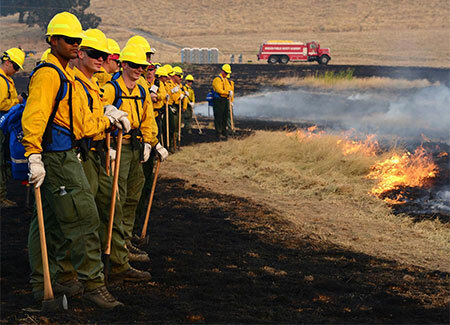 The courses are conducted under the National Wildfire Coordinating Group’s program, policies and standards for training. 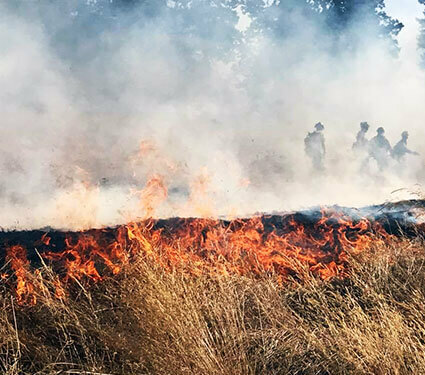 Courses cover only the ground battles, which are waged with everything from shovels, rakes and hoes, and “flappers” – mud flaps attached to long poles – to backpack water sprayers that “look like big Super Soakers.” Airborne wildfire fighting is not included. Lessons in Oregon began with a class on fire behavior that focused on how weather, topography and fuel all can drive fire. Remaining days were spent in the classroom during the morning, where the troops learned about preparation for firefighting, and in the field during the afternoon. A fortunate change in the weather during the training gave the upper hand to the crews already on the job, he adds. As a result, only half of the 250 National Guard members were dispatched after their four-day prep. “This was the largest group of National Guard that I’d been around, and you just cannot say enough good things about them, their work ethic and their commitment to go out and do good things for the community,” Builta says. He also is grateful for the cooperation of the Oregon Department of Public Safety Standards and Training and the Oregon Department of Forestry. They join similar agencies from Georgia, Montana and California who have received assistance from trained Illinois Fire Service Institute staff members. California’s devastating wildfires this fall are the result of “two major problems,” Builta says. “From what I have read, the spring was really wet in California. The grasses grow a lot and give you a lot of fuel for a fire. Then, they didn’t get a lot of rain, the grasses dried and made for lots of fuel on the ground,” he says. 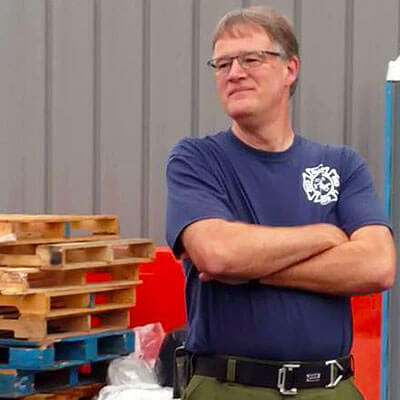 Although Builta is a frequent trainer of wildland firefighters, teaching those courses across Illinois between five and ten weekends each year, he rarely can accept the two-week standard deployments to battle the blazes. “With my job, it’s hard to that,” he says. However, fighting fires is an important part of his life at home – and one that involves the whole family. Builta’s wife, Joelle; their son, Christopher; their daughter, Danielle Kaecker; and her husband, Justin, all are members of the Hillcrest Fire Department. Christopher recently returned from Montana, where he was dispatched to help fight the wildland fires there. The story began 21 years ago when the Builtas bought their home in Hillcrest, located just north of Rochelle, along Route 251. Joelle, pregnant with Christopher, was on doctor-ordered bed rest. Steve was unpacking boxes. As a powerful thunderstorm rumbled through town, a violent lightning strike rattled the house.